UX strategy has 3 key elements: the environmental or attitudinal things you can’t change; the things you can succeed at; and knowing the difference makes all the difference. What better to illustrate a prayer than a cross-stitch? Based on IBM Plex Sans. Illustration by Joe Pemberton. Repeating buzzwords can make it sound like you have a strategy, but you just might be jumping on the next crypto-, AI-, wearable- bandwagon without a real plan. Actual strategy requires having a well defined problem. A problem you’re going to work on until you get it right. Because strategy requires the discipline to decide what you’re not going to do. 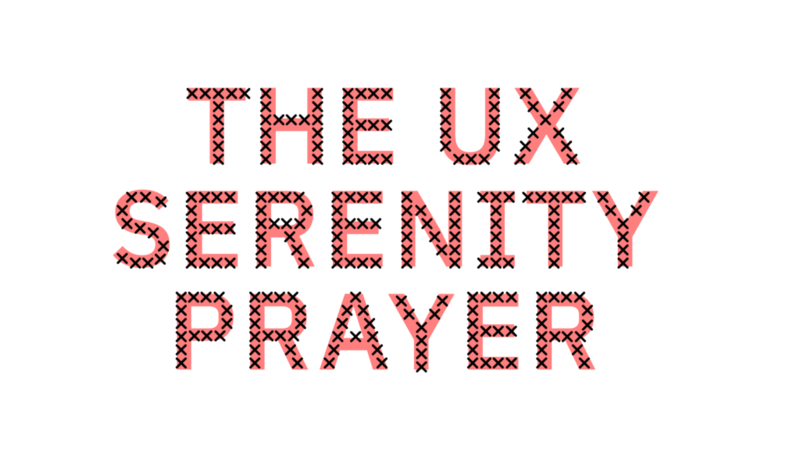 The user experience serenity prayer was originally published in UX Collective on Medium, where people are continuing the conversation by highlighting and responding to this story.